The letter outlined the Toronto-based coalition’s plans to further attack the rights of honest Canadians by demanding the confiscation of their handguns and certain other firearms, and pushing for more police surveillance and privacy intrusions. The government is examining a “full ban” on handguns and many rifles and shotguns. It also proposed Bill C-71 as a law to prohibit more guns and make it tougher for the 2.2 million federally licensed shooters to buy, sell, own and transport firearms. The draft text could become law this year. 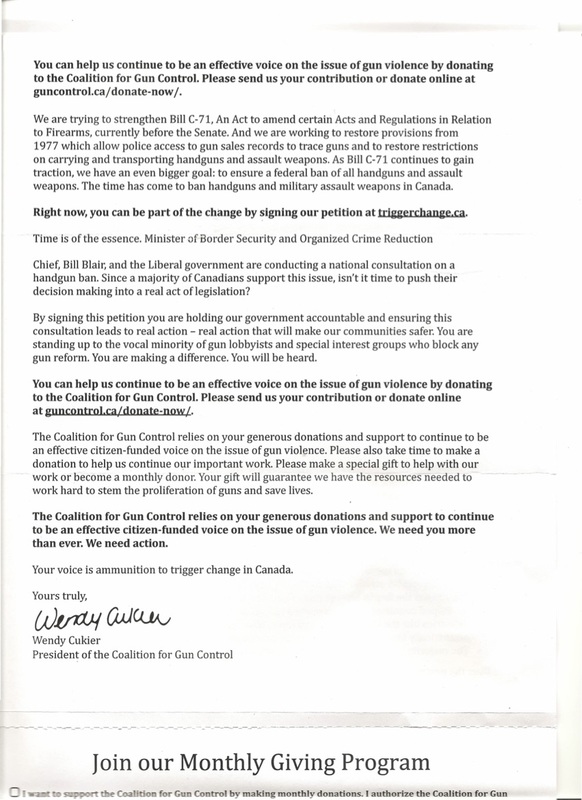 A PDF of the letter was sent to TheGunBlog.ca by a recipient. 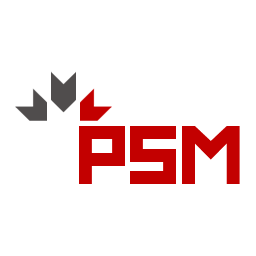 We removed their personal information and are publishing a transcript and the PDF with their permission. 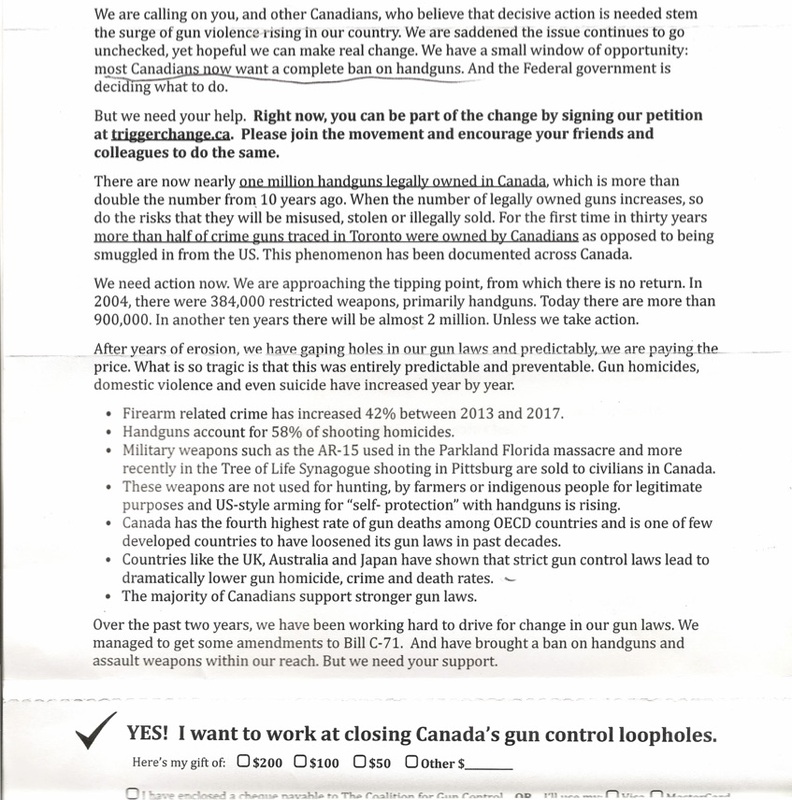 TheGunBlog.ca didn’t receive a reply after e-mailing the coalition today to verify the letter’s authenticity. Subscribe and support TheGunBlog.ca so we can continue to support you with exclusive news, including the enemy’s attack plans. Join or renew with at least one national gun-rights association and provincial hunting association. Share this article with your gun club, shooting range and others who care about their firearms and their rights. We are calling on you, and other Canadians, who believe that decisive action is needed [to] stem the surge of gun violence rising in our country. We are saddened the issue continues to go unchecked, yet hopeful we can make real change. We have a small window of opportunity: most Canadians now want a complete ban on handguns. And the Federal government is deciding what to do. But we need your help. Right now, you can be part of the change by signing our petition at triggerchange.ca. Please join the movement and encourage your friends and colleagues to do the same. There are now nearly one million handguns legally owned in Canada, which is more than double the number from 10 years ago. When the number of legally owned guns increases, so do the risks that they will be misused, stolen or illegally sold. For the first time in thirty years more than half of crime guns traced in Toronto were owned by Canadians as opposed to being smuggled in from the US. This phenomenon has been documented across Canada. We need action now. We are approaching the tipping point, from which there is no return. In 2004, there were 384,000 restricted weapons, primarily handguns. Today there are more than 900,000. In another ten years there will be almost 2 million. Unless we take action. After years of erosion, we have gaping holes in our gun laws and predictably, we are paying the price. What is so tragic is that this was entirely predictable and preventable. Gun homicides, domestic violence and even suicide have increased year by year. Firearm related crime has increased 42% between 2013 and 2017. Handguns account for 58% of shooting homicides. Military weapons such as the AR-15 used in the Parkland Florida massacre and more recently in the Tree of Life Synagogue shooting in Pittsburg are sold to civilians in Canada. These weapons are not used for hunting, by farmers or indigenous people for legitimate purposes and US-style arming for “self-protection” with handguns is rising. Canada has the fourth highest rate of gun deaths among OECD countries and is one of few developed countries to have loosened its gun laws in past decades. Countries like the UK, Australia and Japan have shown that strict gun control laws lead to dramatically lower gun homicide, crime and death rates. The majority of Canadians support stronger gun laws. Over the past two years, we have been working hard to drive for change in our gun laws. We managed to get some amendments to Bill C-71. And have brought a ban on handguns and assault weapons within our reach. But we need your support. You can help us continue to be an effective voice on the issue of gun violence by donating to the Coalition for Gun Control. Please send us your contribution or donate online at guncontrol.ca/ donate-now/. We are trying to strengthen Bill C-71, An Act to amend certain Acts and Regulations in Relation to Firearms, currently before the Senate. And we are working to restore provisions from 1977 which allow police access to gun sales records to trace guns and to restore restrictions on carrying and transporting handguns and assault weapons. As Bill C-71 continues to gain traction, we have an even bigger goal: to ensure a federal ban of all handguns and assault weapons. The time has come to ban handguns and military assault weapons in Canada. Right now, you can be part of the change by signing our petition at triggerchange.ca. Time is of the essence. Minister of Border Security and Organized Crime Reduction Chief, Bill Blair, and the Liberal government are conducting a national consultation on a handgun ban. Since a majority of Canadians support this issue, isn’t it time to push their decision making into a real act of legislation? By signing this petition you are holding our government accountable and ensuring this consultation leads to real action — real action that will make our communities safer. You are standing up to the vocal minority of gun lobbyists and special interest groups who block any gun reform. You are making a difference. You will be heard. You can help us continue to be an effective voice on the issue of gun violence by donating to the Coalition for Gun Control. Please send us your contribution or donate online at guncontrol.ca/donate-now/. The Coalition for Gun Control relies on your generous donations and support to continue to be an effective citizen-funded voice on the issue of gun violence. Please also take time to make a donation to help us continue our important work. Please make a special gift to help with our work or become a monthly donor. Your gift will guarantee we have the resources needed to work hard to stem the proliferation of guns and save lives. Your voice is ammunition to trigger change in Canada.